Deeside Dragons boss Lol Paul is determined to draw the positives from his pre-season programme, despite a 4-2 defeat to Telford Tigers NIHL. Saturday night at Chester Road saw a healthy crowd welcome the Red Hockey era to Flintshire, following a summer of changes at the club. 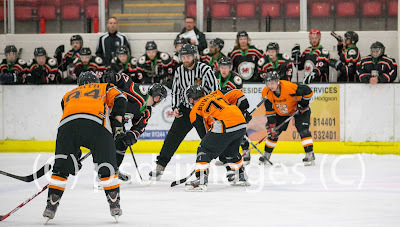 But with Telford taking advantage of a slow start to secure a 4-2 victory, Paul must now wait until the start of the NIHL season next weekend for his first win. And the Dragons chief believes his side is poised to fulfill expectations in the Laidler Conference. He said: “It was a good game for us and there were a lot more positives than negatives. We outshot Telford by nine shots, but their netminder stood on his head. “That isn’t to take anything away from The Tigers, and they never stopped pushing our guys. “We’ve got two good imports and a team of strong players, so we should be a match for anyone in the league. Philip Mulcachy was first on the scoresheet for Telford after just six minutes, before a strike from James Smith just moments later. Deeside hit back through Adrian Palak at the start of the second period, although the visitors secured victory later on with goals from Callum Bowley and Brad Betteridge. That was despite a late consolation goal from Deeside’s Filip Supa. Paul added: “It was a good atmosphere in the rink, but I want a really packed out crowd next Saturday night for our first league game against Blackburn. “When there is 800 people in this rink, the noise is incredible and it really spurs the guys on.